History: Ludhiana's Clock Tower, popularly known as 'Ghanta Ghar', turned 102 last year. It was on October 18, 1906, that Victoria Memorial Clock Tower, Ludhiana, was inaugurated by the then Lt Governor of Punjab, Sir Montgomery. Mohinder Aggarwal, general secretary of the Punjab Pradesh Beopar Mandal who has a showroom nearby, says, "I am pained to see the century-old monument in utter neglect. We all are equally responsible for it." The clock often stops and it takes a few days to restart it. 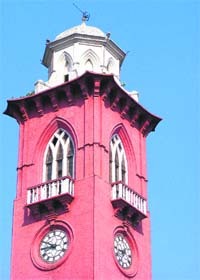 The tower was erected in the heart of the city, with Chaura Bazaar, courts and tehsil office in the vicinity, but today it is more popular for staging demonstrations. Old-timers recall that earlier the tower could be seen from a distance, but today high-rise buildings and pollution have enveloped it.